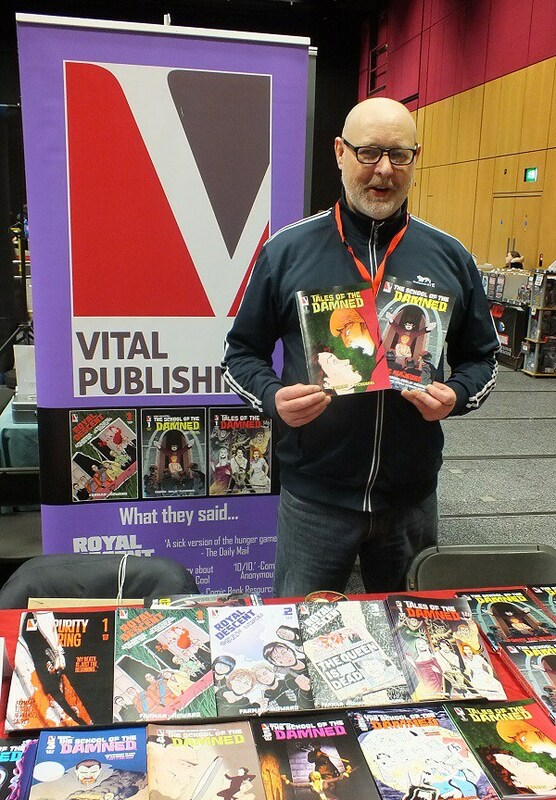 Vital Publishing are delighted to announce our first Convention appearance of the new year, we will be in attendance at Edinburgh Comic Con in April 2017. The event is held at Edinburgh International Conference Centre on the Exchange, 150 Morrison Street on April 15th & 16th. In attendance will be Vital Publishing’s very own John Farman, writer of Purity Ring, School of the Damned, Royal Descent and the company’s newest upcoming title, SPIES. 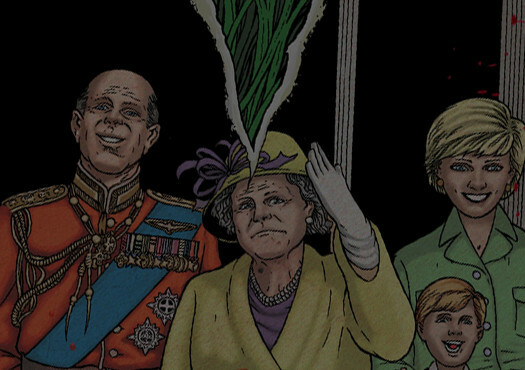 The event will mark the launch of the Royal Descent vol. 1 trade paperback. Also available will be a full stock of all previous back issues as well as another new title release, we’ll reveal a little bit more news over the coming weeks, so stay tuned. In the meantime we’ll hand over to John F. to explain why he was so keen to return to ECC 17. Having been on both sides of the convention floor as a co-producer and a vendor for just under a decade, in that time I’ve been to some great events and some for whatever reason, not so great events. When the opportunity came to exhibit at ECC 17 (I know it sounds like a boy band!) I didn’t hesitate with my application. Having attended the year before I was blown away by the venue, staff, fellow exhibitors and finally and most importantly, the paying public. Bare with me and I’ll go into a little more detail.. I really like the new ECC venue, it’s modern, bright, clean and spacious. Having attended quite a few conventions it can be a bit hit and miss in terms of facilities and room. The table spacing and floor layout was easily remembered and very clean. There were no traffic jams and no patrons looking exasperated or annoyed, I think the space really contributed to the relaxed and happy vibe throughout the day. The one downside to exhibiting a convention is you rarely get to see panels or interviews, but what is important is seeing the happy faces of people who have, it’s generally a good sign for an event and dare I say sales. Happy and satisfied patrons make for a better all round event, whether they buy your book or not. Time flies when you’re having fun. Again the facilities at ECC are spot on, clean bathrooms and areas where you can buy some water (needed from talking too much.) or a snack and just generally chill out. All areas are again well lit and clean which everyone appreciates. One of the shortcomings of Conventions is an old bug bear, too few staff. This was certainly not the case last year, the staff where always on hand to help, whether looking for a stall or helping stand on the table during a break, always with no complaints and a smile. These little things are very much appreciated by exhibitors, Comic Cons are tiring. It’s always nice to see a helpful smiling face. Having known ECC organiser, James Lundy for quite a few years, I’ve always found him to be a straight up and trustworthy person. He is genuinely interested in how the event is going for you and takes on board any suggestions, I fully understand when running a show sometimes that last thing you have is time to talk and chat. It’s can be quite stressful running a large convention but to his credit, James listens and always asks how things are going. Again another aspect that is important for the exhibitor, I think this leads to a stronger and more relaxed relationship. I have been to quite a few conventions where I have never even met the organisers. Last year was one of my favourite ever shows, everyone seemed relaxed and happy, a lot of folk stopped to chat and talk about the work, some bought some a book or two and some didn’t, as is always the way. What was very encouraging for me was the feedback I received on the purchased books. It is always a pleasure to hear someone likes what the company does and return to invest more of their time and money in the work. I’m finding it hard to remember a better experience at a convention in terms of feedback, sales and general chat. Even having attended a convention before is no guarantee of the same sales. You do tend to log in your head which shows you sell well at. I was very happy and surprised that last year trumped the year before in terms of sales, the company saw an increase of 40% in sales, this was helped by the first trade paperback of School of the Damned selling well on the Saturday but even better on the Sunday, in fact all of the books sold better than expected on Sunday, so much so that Saturday’s sales were surpassed by 1pm. Of the stock taken, I sold a whopping 80% of it, with Tales of the Damned # 2, School of the Damned #1, Purity Ring #1, Royal Descent #1 & 2 all selling out completely by 2pm on Sunday. This year I am very excited to have two or (schedule permitting) three new books to showcase, Royal Descent #4 will be available as will the Trade Paperback of Royal Descent vol. 1, Anarchy in the UK. We also hope to have one other new title debuting, we’ll havemore news on that one soon. 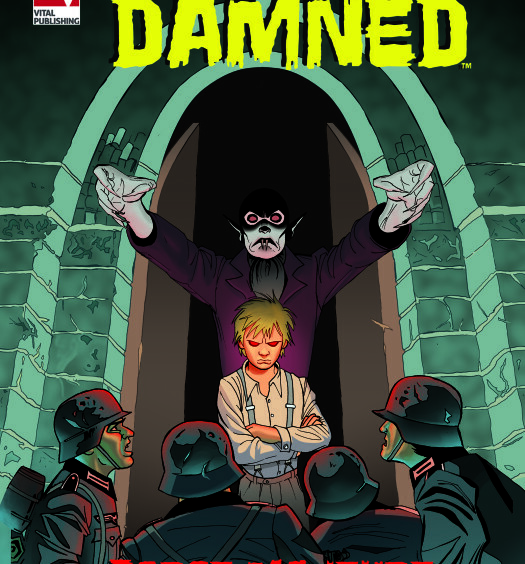 Also available will be School of the Damned Trade Paperback vol 1. Force Majeure as well as the individual issues of SOTD #1-6, Tales of the Damned #1-2, Royal Descent #1-3 and Purity Ring #1. All in all, a full table of titles and stock, remember if you are coming to stop by and chat about all things comics.